Blood thinners such as warfarin or Coumadin are prescribed by doctors for patients who are at risk of serious health complications due to blood clotting. As with most medications, certain foods are contraindicated for patients on blood thinners. 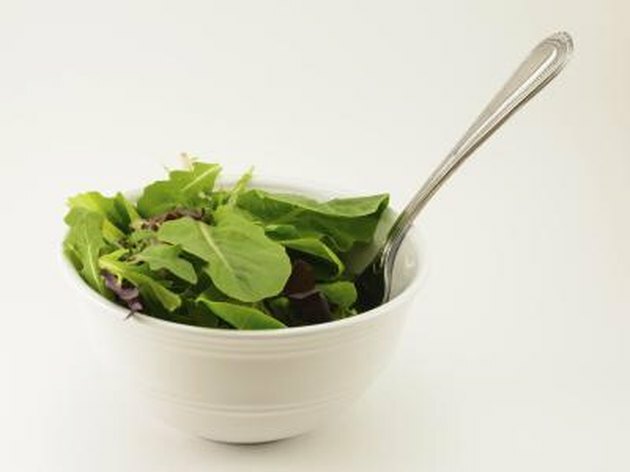 Eating large amounts of leafy green vegetables may cause substances within the vegetable to interfere with the way your medication functions. Blood thinners inhibit the formation of blood clots and reduce the risk of stroke, heart attack, pulmonary embolism and other conditions blood clots can cause. Blood-thinning medications, also known as anti-coagulants, can slow the rate at which clots form and prevent existing clots from growing larger. Blood thinners may also prevent clots from breaking into smaller pieces that can travel through the blood vessels and damage your heart, lungs and brain. In most cases, leafy green vegetables are wholesome healthy foods that most folks don’t eat enough of. But if you’re on blood-thinning medication, your doctor may advise you to follow certain dietary guidelines, including limiting your intake of leafy green vegetables or at least keeping your consumption consistent from week to week. Vegetables such as kale, spinach, turnip greens, broccoli, parsley, collard greens, Brussels sprouts and chard should not be eaten in large amounts due to their high content of vitamin K – a nutrient that can interfere with the effectiveness of your blood-thinning medication. The name for vitamin K was derived from the German word “koagulation.” That’s because the only known biological function of vitamin K is to assist in the coagulation cascade, a series of chemical reactions that must occur in a precise sequence in order for a blood clot to form. Some blood-thinning medications work by inhibiting the action of vitamin K. So, if you’re taking blood-thinning medication and consuming large amounts of vitamin K-rich leafy green vegetables, those two substances are working at cross-purposes and may cancel each other out. If you are taking blood-thinning medication, ask your doctor for dietary guidance. In addition to leafy green vegetables, some types of vegetable oil, such as soybean, cottonseed, canola and olive oil, also contain high amounts of vitamin K and may not be advisable for those taking medication to reduce their risk of blood clots.